Home » Job promotion or more work for less pay? This scenario is all too common and probably will become more prevalent since lack of productivity stagnates today’s economy. Employers must find ways to make a profit and satisfy tax obligations. The decision to accept responsibility for this opportunity is in part monetary compensation, which definitely needs to be addressed but also on quality of life. With all challenges, personal growth comes about by overcoming obstacles and barriers but not without stress. Monetary compensation aids relief of stress but ultimate satisfaction comes from the personal decision to grow beyond your current circumstance. If you are seeking new challenges then negotiate additional compensation and be prepared to change your lifestyle. If life is good ‘as is’ decline and enjoy! Actually productivity in the USA is at an all time high, and has been, for quite some time. Just because companies aren’t sharing those gains with you, does not mean that they aren’t making them. EEDR: A friend of mine refers to this as “junk profitability.” Companies lower their costs by piling more work on employees without equivalent pay increases. It’s “junk” because it can’t and won’t last. Poor management always collapses. Disagree on productivity at all time high. For example, Mayo Clinic CEO recently announced their problem to provide affordable health care is lack of productivity due to duplication of efforts. Also, statutory regulations are stifling productivity. Agree on “junk profitability”. . . greed and incompetence are corporate death spirals. Good news, plenty of choice opportunities in the USA! @Paul, How can you disagree about a matter that is factual and not a matter of opinion? Productivity is something measured and quantifiable. Yes, some employers want to keep all of the gains for the top, while blaming regulations or health care or solar flares, but those are all simply irrelevant excuses for not paying the rank-and-file what they deserve. It would be foolish to believe their self-serving lies instead of the official statistics. “This fact might strike some as surprising: workers in the U.S. business sector worked virtually the same number of hours in 2013 as they had in 1998—approximately 194 billion labor hours.1 What this means is that there was ultimately no growth at all in the number of hours worked over this 15-year period, despite the fact that the U.S population gained over 40 million people during that time, and despite the fact that there were thousands of new businesses established during that time. Sorry, Paul. It is what it is. What is your source that is more credible than the official statistics collected by our government? I was working in a well known, medium size, local social services agency. No one wanted to relieve the receptionist because it was constant stress of 2-3 phone lines ringing in at once, angry clients, and walk in people with no appointment. Part of the problem was staff ignoring clients and staging a work slow down that meant most people were not served. So I was told I would be lunch relief 4 days a week at the front desk. I was already limited to 30 hours and had a crazy boss who wanted my attention all the time. She would have decided to have a meeting with me at the time to relieve the receptionist just to jack everyone around and create a scene. I could not handle the stress of this front desk — I’d end up shaking and panicking. So I said no, wasn’t in my job description and if you insist, then my health is most important and I will be forced to quit sooner or later. No offer to make me full time to accommodate the increased demand on my time, either. My nutty boss was happy I said no as she didn’t want to share me. Nothing was ever said to me b/c the manager was afraid of conflict. I ended up leaving a year later b/c the manager wouldn’t rein in my boss’ abusive antics. So consider the culture there and whether or not the run from conflict. You can more easily challenge them if they hate conflict in my experience. It really doesn’t matter whether your questioners are under-worked or not. Admitting you’re under-worked and have been for some time is career suicide. If anyone reading this is, in fact, under-worked, let your manager know you don’t have enough to do and are prepared to take on additional responsibilities. That makes you look like a pro, and someone worth promoting. But that’s a different subject than admitting it in this context. Bob: I’m not sure where we disagree. Your approach goes even farther than mine, and I like that. You advocate turning the job merger down flat. My approach leads to a newly defined job after a negotiation. I like both approaches. I’ll admit that I walked a little more softly (though not much) because I think most employers in this situation would balk at either of our solutions. I agree with Bob. Besides finding time for another 3 – 5 hours in a packed 40 hour week, what new job would only require 5 hours of work? Writer #2 will either find him or herself working 50 hours a week just to stay up or falling behind and failing. It is easy for HR types to combine two boxes on an org chart, a lot harder to make it work. Didn’t get impression either poster seeking promotion or extra work, so thought same thing as Bob Lewis. Are these part or full time jobs? Neither sounds like a promotion (far from it, given the informal handling), but an attempt to get more for less by mashing jobs together. Going to a new employer is almost always a sure way of bettering your circumstance, be it not enough compensation or general unhappiness. Being a “lifer” isn’t as honorable or valuable as it used to be (think: accidental leader). Look at your current executives and senior leaders; how long have they been at your company? Your 15 years of service is only as long as their two year stint (in their eyes). They never saw you for the previous 13 years, so WHO CARES about the previous tenure, right? As much as I want to encourage long tenure, change is also incredibly beneficial. Manage your career and don’t WAIT for your employer. 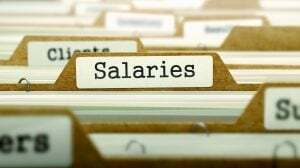 Is it all about salary? I was newly hired for one job and asked to fill in a higher level job at the same time for the same money until they hired the other person. (That person would not have been my boss). I took on the added duties because I was new and really liked the job I was hired to do. During the course of the year I was in the two jobs, they raised my salary 25% because I complained I was doing two jobs and being paid for one. But the salary rise couldn’t have helped even if it was corrected because I didn’t enjoy doing the extra job’s tasks. They offered me that higher job but because I preferred research and writing to paper pushing and budgets, I turned it down and took the lower salary. Never regretted it and am still in the same workplace. Do you enjoy the added work? That should be the question before salary comes up. I think your example just proved Nick’s point. Your company got a huge benefit at your expense, especially since you didn’t ask for it. Yes, they benefited at my expense. But my point was that salary increase wasn’t the main consideration for me. That’s why when they offered me full higher compensation for the higher level job, I turned them down. I think job content is equally important, although maybe more for me than others. I’m not Buddhist but I like the concept “right livelihood,” which is what draws me to this blog. When considering whether or not to take on two jobs, salary increase isn’t the only consideration. Many do jobs they dislike for higher salaries, and pay for it in ways they discover later. Articles like this puzzle me, since they outline a scenario that in other contexts would be considered unethical, if not illegal. Imagine the reaction if you asked (never mind required) your lawyer, dentist, plumber or gardener to perform extra work for free. Yet companies routinely expect same even from hourly employees (by working “off the clock”). I know exempt employees must work occasional overtime, but this is routinely abused. Having been exempt my entire career, did my share of overtime, many thousands of hours. But more often than not, resented such because I felt it due to mismanagement, unrealistic scheduling, deliberate understaffing, or just plain taking advantage. Its a giant loophole that needs plugging. Note about exempt employees. If you look at the USA department of labor definition of exempt status you will discover that it is another area where employers abuse workers just having an advanced degree or title does not automatically make you exempt. You actually have to have managerial responsibility. @Nick Good topic for another blog. At my last employer, the abuse of “exempt” employees was so bad that the Feds got involved. They found over 1500 violations of the FLSA, told the school they had x amount of time to fix it, and if not, there would be further pain in the form of fines. You’re right–it is very, very common. Good points . . .to clarify, my productivity context comes more from running a for-profit business. 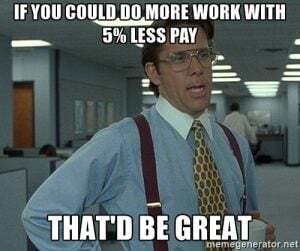 When cost of output that can be $50 per hour is actually $100 per hour due to factors imposed by inefficient work rules, poor management, lack of innovation and government sanctioned regulations . . . that’s a productivity issue. Growing cost of health care is a perfect example of burdened productivity. Government statistics may be a source of credibility but those statistics are always looking in the rear view mirror . . . did you hear about the statistician that drowned in the average of 6″ of water? @Nick: Sh*t you not, walked in this morning not a day after your blog post to receive such news for myself. I am thankful I had this blog post in my mind so fresh because I was immediately able to start asking questions such as “will there be a new job description?” and to make such observations vocally that my job will consist of two full-time positions. Of course there is more to be said and hopefully I can tackle it as one should. Thank you! I feel equipped to professionally tackle org changes (of which I knew were coming but did not know how). Commenters here have covered most elements of this situation, except one: understanding the salary for a particular role. If HR is just trying to match job titles, they are doing it wrong. When we conduct salary reviews, we select several “likely close” job titles, then identify the relevant job responsibilities within those titles. This tells us how close our jobs are to each of those titles, which then determines a weighted salary range. It takes a bit more work, but with a far superior result. Oh, and we don’t know reveal the salaries related to each title, so we aren’t cherry-picking the higher compensation. Financial institutions continue to be slow learners . . . can u say Wells Fargo?? You could say “Wells Fargo” but you would also have to include places like the Phoenix VA Medical Center: This is what happens when you institute a program that gives a bonus to a person to simply do their job. RE: Profitability, junk or otherwise. It all comes to a screeching halt when there continues to be over 1/3 of the working population un- or under-employed, and (by extension) not having disposable income to buy things. Since government at any level is unable or incapable of creating jobs, it falls to the private sector to get off the pile of accumulated cash and just make some middle-class jobs. Do some expansion. Prime the pump. You get the drift. Job consolidations are good news bad news scenarios. They are bad news if you wait for HR and/or a boss to define the job and “take care of you” for pitching in. tasks like that seem to just creep off into the horizon to your detriment. As the one writer said, HR just reached into a grab bag salary survey for something that paid in the area of their guesstimate and satisfaction. The good news is these scenarios also can be turned into opportunities. I lean to Bob’s suggestion. Sit down and write your own description. And in the process don’t make it two jobs. There are usually redundancies in consolidations, so instead of 2X in size, it’s 1.X times. In the process don’t be shy about writing out some functions, and dumping them elsewhere or just eliminating them. Do your own survey and find or create the right title to go with the description and find out what it’s worth on the market. Now you can negotiate, starting with “well if it’s not this, what is it? and what’s your take on compensation. If you can’t come to terms, then crystalize your plans and move on. Years ago, I was offered a job to move to Asia and set up a software development lab. That’s the description. There wasn’t anything comparable at the time, and as someone noted, the content or potential content was enticing. I took it one. Once there, I fleshed out the aforementioned non-description, entitled myself “Director”, and built up a lab, improvising my duties as I went. I see a lot of job consolidations, and I’ve wondered where these employers think they’re going to Superman and the Energizer Bunny rolled up into one. The job that I see most often that used to be two separate and distinct full time jobs is Director of Admission/Director of Financial Aid at many colleges and universities. Admissions is crazy-busy for most of the year–lots of travel and working nights and weekends in addition to the regular hours during the fall/winter, then less travel but employees take work home with them in order to get all of the reading and assessments done in a timely manner. I’ve never understood how they expect the person who is running admissions (and doing travelling and reading herself) to take on another full time job and handle financial aid. This employer is being cheap and insulting the LW’s intelligence by trying to snow him (“this is a promotion!”) because they’re not willing to pay him for taking on the additional duties. I like both Nick’s and Bob’s suggestions, and in the meantime, I’d start looking for a new job.